Lieutenant. Huhmann was the First Officer on the flight deck of the C-17 jet that brought us from Christchurch, NZ to McMurdo Station, Antarctica. 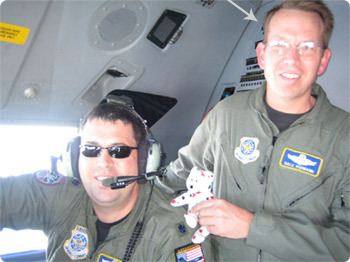 He is one of several military officers associated with the Air National Guard of Seattle, WA who fly the airplanes that bring science cargo, support personnel and scientists to the Antarctic. When he is not on duty, he lives in Pulyallup, WA with his wife and daughter, but he grew up in Tuscumbia, MO. His passion is flying and it has been his job for 21 years, but this was his first mission to Antarctica. "Flying for the Air National Guard is a great way to see new places and cultures," according to Lt. Huhmann. But he quickly adds that the job entails long hours of work and a lot of time away from his family. The C-17, which is a wheeled jet aircraft that can be outfitted to carry cargo and/or passengers, is a very sophisticated plane. Lt. Huhmann was impressed with the many of the instruments, particularly some of the sensors, and how capable it was. He noted that it had two GPS systems for navigation and 4 inertial systems. He says that it is "truly a workhorse." One interesting thing about this particular plane that we were on was that it was its "maiden voyage." Other C-17s have flown to Antarctica, but this one was brand-new. When asked if flying to Antarctica was a dangerous job, Lt. Huhmann said that it wasn't. "We're trained to handle things so that dangerous situations are averted or taken care of routinely." One of the things that makes Antarctica a more challenging mission is that it is so far away from all other airports and that the weather can quickly change. This means that the crew has to monitor the weather reports all the time and make a decision by half-way through the flight as to whether they can safely land in Antarctica. Once they have passed the half-way point, they are committed to landing because they will not have enough fuel to turn back later. This plane carries so much cargo that it cannot carry a lot of extra fuel. Having to make an early decision means that sometimes the weather worsens and the crews have to land in difficult weather conditions that in another country would cause the flight to divert to a different airport. Landing on ice runways is another skill that only a few non-Antarctic pilots have to learn. He noted that the Air National Guard has a lot of women pilots and officers, although this particular aircraft mission was staffed by all men. We did have a chance to meet one of these women when some of our team flew from WAIS to McMurdo. So there are opportunities for everyone to be a part of this great group. The most important skill needed to be a pilot or first officer is, according to Lt. Huhmann, being self-motivated. You have to be able to motivate yourself to stay focused on a task and do it correctly, especially on long flights like these. Flying today requires good math and excellent computer skills. Before I went on the flight deck, the crew members had spent about 2 hours entering data about the flight into the computer. They would continue this data entry periodically through the flight. Lt. Huhmann also says you need to be able to learn new things quickly and be able to remember them accurately. The job requires people to be able to make quick and informed decisions. Lots of things depend on your decisions. His advice to students is "do your best in school." He says that is what he stresses with his 8 year old daughter. This would be a very interesting job. There are so many visual and numerical displays and instruments to monitor to keep the airplane flying and lots of paperwork to do as well as wonderful views from the cockpit. The view of Antarctica as you fly in is absolutely breathtaking and the other officers in the cockpit say that they never tire of seeing it. It is also critical to the advancement of polar science. Without these dedicated men and women of the Air National Guard, Antarctica would be inaccessible to most scientists.